Patient awareness is the single most important factor in the success of telemedicine in your practice - with the key being to consistently talk to your patients about video visits. Marketing telemedicine to your existing (and new) patient base is easier than you may think. Capture patient’s attention while they are already in the office with printed marketing materials. Whether patients are in the waiting room or exam room, this is a great time to educate patients on all the services your practice provides - including the convenience of video visits. 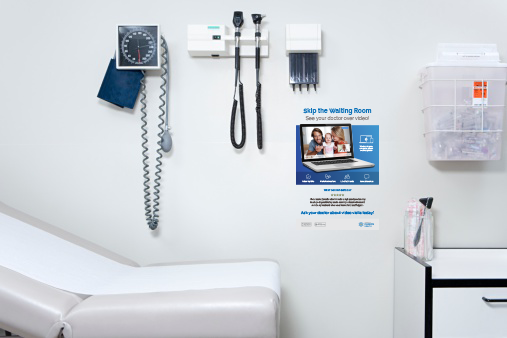 Posters are a great asset to use in exam rooms, while patients are waiting to see their physician. They inform the patient that they are able to see their provider over telemedicine, as well as describing some great appointment types. Brochures are ideal at the checkout counter, to remind the patient that their next appointment may be applicable for a video visit. Brochures help to explain telemedicine, answer some common FAQs, and detail how patients will setup and login for their next telemedicine appointment. Window clings on outside windows will spark interest before a patient checks in for an appointment, and increases the likelihood of them asking front office staff or their physician about this possibility.